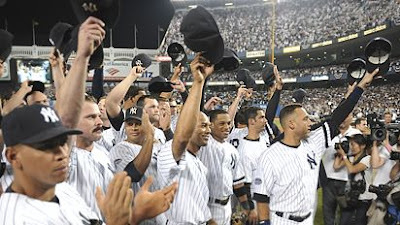 So the New York Yankees 13-year playoff run has come to an end, and so has its tenure at the historic Yankee Stadium. The stadium that has created so many memories and has allowed Ruth, Gehrig, Mantle, Maris, DiMaggio, Jeter, Rivera and so many other legends to roam the grass and dirt that has stood there for 85 years. It was a special moment las Sunday night, when Mariano Rivera came into Metallica's, Enter Sandman, Yankee fans new it was almost over. Rivera as he has done so many times in the past, made quick work of the Baltimore Orioles hitters and that was it, Yankee Stadium hosted its last night of baseball. Shortly after the players shook hands the Yankees met in the infield to salute the fans, where fan favorite and long-time team captian, Derek Jeter spoke. He told fans that the memories of this stadium didn't end when they tore the old ballpark down, but lived in infamy through those who remember them. It wasn't Lou Gehrig's, "Luckiest Man" speech, but it was moving. Jeter will be one of the remaining legends that moves with the Yankees across the street to the new $1.4 billion dollar stadium. In many ways it's fitting (and by no means does this mean I'm happy the Yankees aren't making the playoffs) that the Yankees are missing the post-season for the first time in 13 years. The Yankees have made history with 26 World Series Championships in that Stadium and so many amazing games, but its time for the fans, players and baseball to move on. The Yankees have new memories and new dynasties to build across the street now. Yankee Stadium left us like a John Wayne in a western, it gave us its time and then rode off into the sunset, no encore needed, its all over.